Seeing as there are not many Glowstone servers out there I figured I would start one. The game mode is set to survival, although be aware Glowstone’s survival mode is not complete so expect not everything to work properly. This is an opportunity to play test for important bugs or missing features, on a “real” (non-test/temporary/creative) server. You can report any problems with or suggestions for the server to https://github.com/satoshinm/server, a repository which also includes the server’s configuration files. http://netcraft.beerprojects.com running of course WebSandboxMC, exposing a small part of the server to any WebGL-capable web browser. This currently lets you place blocks without limit, kind of like creative but only within the limited web-based area. Players connecting natively can also interact with and see web users. http://netcraft.beerprojects.com:23333 running ThinkMap, an older WebGL-based 3D map viewer. http://netcraft.beerprojects.com:8123 running Dynmap, an overhead view of the server, allows chat and seeing player location. The ultimate goal of the server is to evolve to allow survival play through the sandbox, but that’s a long ways off since neither the server nor web client software is there yet, consider it an experimental testbed to help move it towards this target. Server is hosted on a VPS with an SSD and will run for at least a month, no promises for longer. (You died from FALL) - this is a bug in Glowstone I’ve been meaning to fix, just submitted a pull request here: https://github.com/GlowstoneMC/Glowstone/pull/469 (also applied the fix in Glowstone Light 5 and pushed to netcraft.herokuapp.com). and are stuck in a block. Wew! For now you have to dig your way out it is an adventure :). But it seems to be a race condition or related to timing, I haven’t seen this issue locally but I do see it now, logged a bug to investigate later https://github.com/satoshinm/WebSandboxMC/issues/50. Also, I can’t seem to turn my view. Browser is Vivaldi. Testing with Vivaldi 1.9.818.44, I can replicate this problem. The issue is Vivaldi does not support the Pointer Lock API: https://forum.vivaldi.net/topic/9092/support-for-mouse-cursor-capture/2 - these browsers support it (most modern browsers): http://caniuse.com/#feat=pointerlock. Without it its not possible to reliably capture the mouse to implement mouse look / free look. However, Vivaldi browser does support the HTML5 Gamepad API so if you have a controller that works on http://html5gamepad.com you can use that, or as a last resort, the keyboard’s arrow keys can be used to move the camera. I have not tested much with lesser known browsers, but curiously, testing now with the Brave browser I also see it doesn’t support pointer lock either. And both these browsers are based on Chrome’s Blink layout engine, yet Chrome itself supports Pointer Lock just fine. I’ll see what I can do to better support these niche browsers but my main targets for best support are Chrome, Firefox, and Safari. Thanks everyone for the interest, I have some new developments to share: customized server software specialized for running WebSandboxMC efficiently on cloud infrastructure. Most notably, it has no built-in networking support. How is this useful? By itself, it isn’t, but the idea is you can interact with the game only through the through plugins (or the server console) using the API – such as WebSandboxMC. That is, it is more of a generic server platform, to be extended by plugins using Bukkit. This has some pros and cons: no dependence on the protocol updates since it doesn’t support any protocol, not compatible with Minecraft clients, but it is lighter weight and more independent. It fills a (small) niche, along the lines of what I was trying to achieve by running WebSandboxMC on inexpensive/free server hosts which only allow binding one TCP port, by unbinding the 25565 port for the 4081 port for WebSocket/HTTP. Most people of course will want the full Glowstone, but if all you need is to run this plugin, then the light version can suffice. Wow, I wonder if this can be used as a teaching tool, for instance pre built worlds that a server owner keeps online. Then server fans go to the online version for minigames, contests, server tutorials, etc. Sort of like a 3D interactive forum world. For sure, there’s a lot of possibilities with this concept I haven’t even thought of yet, will be interesting to see how servers use it in practice as it develops. I did notice a bug on the live demo. When you place a block it flings your view finder back down to face the ground and seems to spin your player. Could you retest on v0.7+ or the live demo, I believe this is now fixed (some weirdness with Firefox mouse events, for the record: https://github.com/satoshinm/NetCraft/issues/56). Wow, this is… pretty neat. I had a quick play with it, and I’m pretty impressed. Small suggestion: How about the ability to disable editing the map in the config? Good idea, just implemented this in WebSandboxMC v0.5, there are now plugin.yml options including allow_break_place_blocks and allow_signs which can be set to false to restrict the web user from interacting with the world in this way (for a more of a read-only “viewer” experience than interactive gameplay). 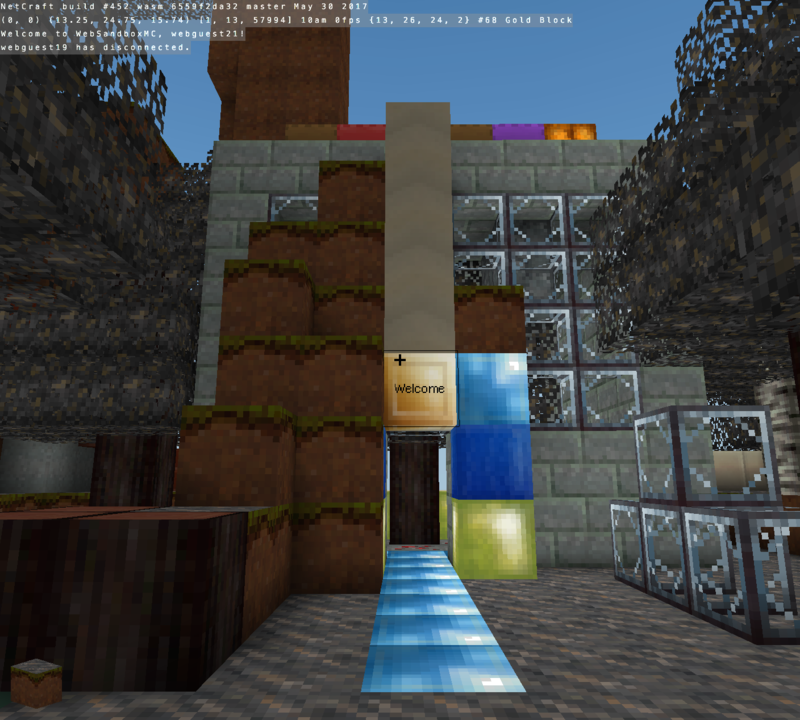 Enjoying the open source Glowstone server and want an open source client to go along with it? 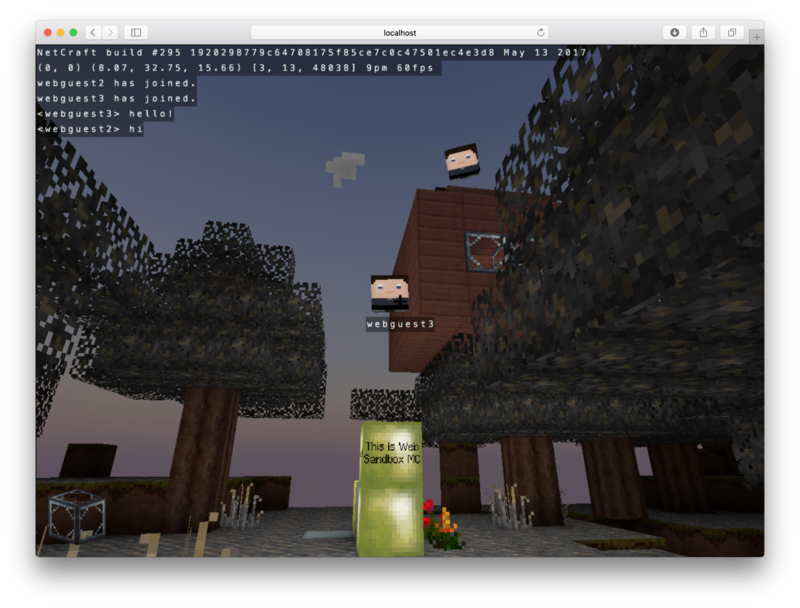 While not a fully-featured client, WebSandboxMC provides a limited yet interactive preview into your server to anyone with a modern web browser thanks to WebGL and HTML5.